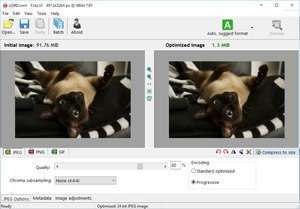 RIOT is an image optimizer which performs different modifications on an image such as the number of colors, the type of compression used and the format in which the program has been saved. The application interface includes a before-and-after preview which is good for comparing the original with the optimized image. The interface of RIOT itself is clean and easy-to-understand while supporting the top three image formats: PNG, JPG and GIF. When RIOT creates GIF and PNG images for the web, it will reduce the amount of color used in the image in order to reduce the size of the picture. Version 0.6.1 is a freeware program which does not have restrictions and it's free so it doesn't cost anything. For security reasons, you should also check out the RIOT download at LO4D.com which includes virus and malware tests. Additional screenshots of this application download may be available, too.